Caribbean party food can add new flavor to your dinner party menu. With creativity and a quick visit to the party store, the spicy and sweet exotic dishes are a tasty way to entertain your friends. Pick through the crabmeat removing any shell or hard bits you may find. Peel the eggs, cut them in half top to bottom. Put the whites aside and add the yolks and all other ingredients to the crab meat. Fill the whites with the crab mix. Cover and chill until time to serve. Caribbean party food can be served hot or cold and that goes for the soups as well. Cut one papaya in half and peel and seed one half. Cut the peeled half into a small dice about 1/8th by 1/8th by 1/8th of an inch until you have enough to garnish six bowls of soup. Peel and seed the remaining papayas and put them into a blender add the water and puree the papaya. Pour the papaya puree into a bowl and add the lime juice a small amount at a time to taste. Whisk in brandy and pour into 6 soup cups. Garnish with papaya cubes. Bring papaya, stock and garlic to a boil reduce to a simmer and simmer for 45 minutes. Add cream, then be sure to not let the soup boil again. Add salt and pepper to taste. If you have an immersion blender puree the soup right in the pot. If you do not have this available, then pour the soup into a blender and puree it. Finally, pour it back into the pot and keep over a low flame until it's time to serve it. This serves two people so if you are having a larger dinner party you will have to increase the amounts. Cut lobster meat into one inch cubes and sauté with butter and shallots. Add wine and cook Au sec. Add the cream and coconut milk and simmer until thick then stir in the rum and milk. Pour into bowls and garnish with grated coconut. Jerk pork is an institution in the Caribbean. Any good Caribbean party will have this Caribbean party food. Heat allspice berries in a skillet for five minuets then grind in a spice grinder. Place the ground allspice in a bowl and add to the bowl the onions, jalapeño, garlic, thyme, bay leaves, salt and pepper and mash it together until it is a paste. Rinse and dry the pork and coat it with the paste cover and let it sit in your refrigerator for at least one hour or overnight if possible. Place the pork on a medium hot grill and cook for one hour. Dessert is just as vital as the appetizers and this Caribbean party food is the perfect sweet ending to your party. Preheat oven to 375. Butter a 9x9 inch pan. In a large bowl mix the sweet potato, nutmeg, gingerroot, brown sugar, and salt. Combine milk, vanilla, water and butter in a medium bowl then add the sweet potato mix. Pour into the buttered pan and bake for 1 ½ hours until it is set. 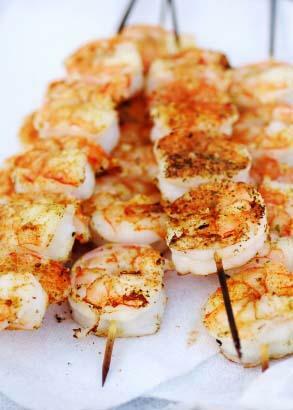 Caribbean Party food can be hot or cold, sweet or spicy but one thing is certain it is always flavorful and fun.